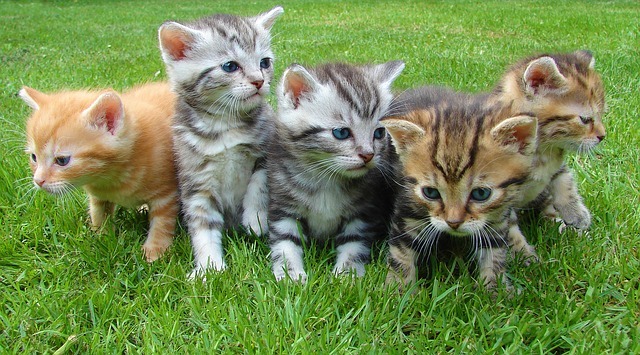 Adorable kittens show off variances in color and pattern, all thanks to their genetics. Cats come in a whole variety of colors and shades, but according to the International Cat Association there are just two that are primary. The color black and the color red. So when you are looking at a cat, what are you really seeing? It is the combination of those two colors, and white, but we’ll get to that in a moment, that make up all the other colors in the kitty rainbow. There are many recognizable colors; black, blue, lilac, gray, cream, red. These are all created from the red and black primary colors. A little more black in the mix will result in the color closer to the black end of the spectrum, such a blue or lilac. More red color will produce shades like brown and cream. White is actually a masking gene. It actually hides the colors. Interestingly, a cat could actually be genetically a black or red cat, but the white gene has come into play. This also means that while a pregnant cat may be pure white, her kittens could be any color – her color without the masking white gene. Pattern refers to tabby, shaded, smoked or similar, of with the white masking gene adding to the mix. Look at a Tortie cat or kitten, as an example. Although usually female, they are a mix of red and black, but add the white masking gene, you have a calico. Somehow that white gene is also linked to blue eyes and the combo often causes deafness. Not sure it’s fully understood yet.